In recent years robots are playing an increasing role in media production. This can range from robots mounted with cameras for carrying out complicated camera shoots where very precise fly pasts are required to robots manoeuvring set pieces and actors in a green screen environment. 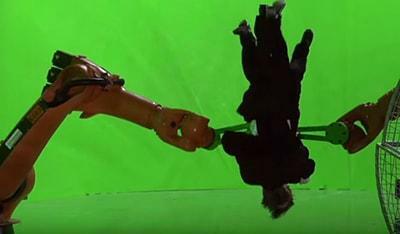 The use of robots has opened up to directors the possibilities of much more involved special effects stunts where full 360 degrees of motion are required and where the traditional methods don’t have the same degrees of freedom. The added benefit of using robots is that every take has exactly the same path a bonus for directors searching for the best shot. The reset time for a move is in the order of seconds saving valuable camera time. Phoenix work within the entertainment industry in the field of robotics supplying programming services, stunt design, training and maintenance services for the robots employed on set.